Split surface crank terminal table for corner application. Aligns with 30" deep Side Tables. 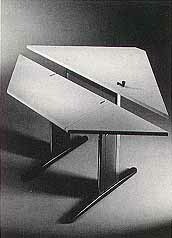 48" corner module when used with 36", 48" or 60" side tables create a 7' 8' or 9' workstation with a 1" clearance between tables. Note: Only the VDT surface is recommended for use with an electric motor. Keyboard Height Range 23"-36.5" 23"-36.5"